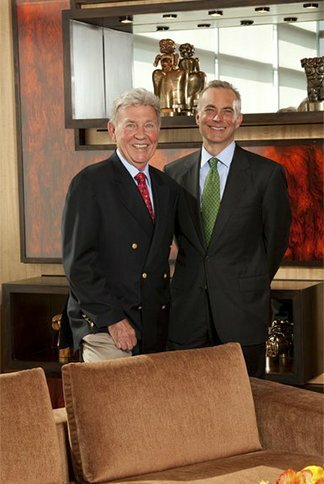 Philosophy | Lowrance Interiors, inc.
Lowrance Interiors, Inc., under the direction of President Jack E. Lowrance and Vice-president Richard Gaz, is recognized as one of the leaders in high end residential interiors design on the west coast. 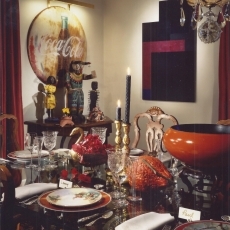 Mr. Lowrance has been honored as one of Architectural Digest’s “AD 100 Top Interior Designers”. Blending the needs of today’s lifestyles with classic architecture and interior design, Lowrance Interiors’ rooms have a freshness that speaks of today, yet recognizes the beauty and richness of historical designs. The resulting décor is airy and spacious, complimenting the architecture not concealing the room. Lowrance Interiors strives to create backgrounds and to select pieces that convey the client’s interests and lifestyles, creating rooms that live. 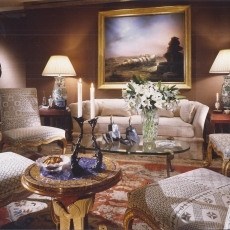 Antiques, client’s artwork and richly upholstered furniture are combined to reflect the client’s character. Individual elements are important, yet the result is a harmonious environment. Lowrance Interiors is a full service Interior Design Firm. The firm handles all aspects of a project from choice of flooring, wall treatments-be it paint, decorative paint finishes, wallpaper or upholstery- design of mill work from built in cabinets and entertainment units to hand carved paneled room, window treatments, lighting plans and the design of kitchen and bathrooms, including specification of plumbing fixtures and fittings, appliances and tile and stone surfaces. From classic to contemporary, Lowrance Interiors is equipped to handle the client’s interior design needs from specification page to finished page from design to delivery. Relationships with some of the best architects, general contractors, furniture builders, upholsterers, drapery workroom and moving companies gives Lowrance Interiors the ability to handle any design job efficiently. The firm strives to take out the headaches and worries out of the client’s hands by overseeing all aspects of the project in order to deliver the best possible interior for the client. 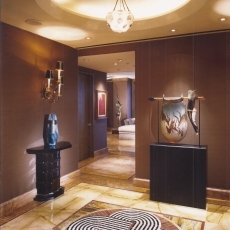 Mr. Lowrance and Mr. Gaz personally supervise every design job and are always at the client’s disposal, be it checking on construction or escorting clients to showroom, art galleries and antique shops. Personal involvement and customer service are the hallmarks of Lowrance Interiors commitment to creating wonderful interiors that reflects the client’s dreams and desires for the place they will call home.